This project consisted of the removal of an existing 20,000 gallon AST and replacing it with a 25,000 gallon AST including demolition of the existing piping and running all new piping to (3) existing generators including a new fourth generator. Additionally, the existing day tanks had to be retro-fitted with new controls. A new remote fill system, fuel monitoring / leak detection system, and duplex submersible pumps with main pump control panel was also provided and installed. 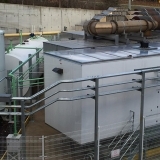 This project was accomplished through careful planning and phasing to eliminate all potential downtime without generator standby power as well as very brief change-overs for connections to each generator. This project consists of the addition of a third 30,000 gallon double wall aboveground storage tank, leak detection system, duplex supply pumps, modifications to existing PLC control panel and leak detection system, welded double wall aboveground remote fill piping, and welded double wall aboveground supply and return piping, stainless steel aboveground pipe transition cabinets, and tying into existing underground piping and system. 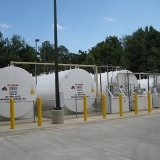 This project consisted of (1) 10,000 gallon Fireguard® thermally-protected UL-2085 receiving tank serving (4) new generators with sub-base tanks including day tank controllers, PLC controls, leak detection system, submersible pumps, automated fuel oil filtration system, and aboveground double wall piping. This existing operational central energy plant site was challenging because we had to shore an excavation via soil-nailing close to the plant in an area with existing utilities and tie into the existing fuel oil system while keeping it operational to support the hospital. 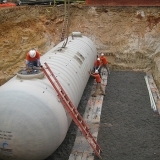 This project consists of (1) 30,000 gallon double wall fiberglass underground storage tank serving (3) generators including day tanks, controls, leak detection system, submersible pumps, and underground and aboveground piping, and the removal of (2) existing underground storage tanks (UST’s). 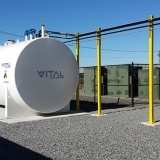 This project consists of (4) 10,000 gallon Fireguard® thermally-protected UL-2085 tanks with integral secondary containment serving (7) 2,250 KW generators with sub-base day tanks. 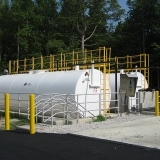 This system also includes a bulk Urea (Diesel Exhaust Fluid – DEF) storage and pumping system consisting of (1) 3,000 gallon stainless steel single wall aboveground storage tank, duplex DEF pumps inside stainless steel enclosure with interior heater and insulation, DEF day tank controls installed on generator manufacturer-provided DEF day tanks inside enclosures, and single wall stainless steel piping. The bulk DEF tank and piping are all heat-traced and insulated. 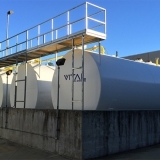 This project consists of (5) 30,000 gallon Fireguard® thermally-protected UL-2085 tanks with integral secondary containment and a full access tank top catwalk system. Each storage tank has duplex submersible pumps serving (8) 550 gallon day tanks with submersible return pumps serve 3,000 KW generators. This system incorporates redundant fuel paths, networks, and PLC-based control panels. 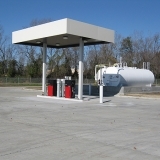 The system also has a remote fill station and a fuel polishing and transfer system. The storage tank piping has double wall aboveground steel piping and the underground piping is double wall UPP® electrofusion-welded piping. This project consists of (1) 20,000 gallon Fireguard® thermally-protected UL-2085 tank with integral secondary containment and duplex submersible pumps serving (4) 2,250 KW generators with 250 gallon day tanks. 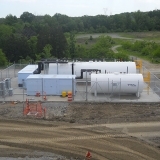 This system also includes a bulk Urea (Diesel Exhaust Fluid – DEF) storage and pumping system consisting of (1) 1,500 gallon carbon steel internally-lined single wall aboveground storage tank, air-operated diaphragm DEF pump, and single wall stainless steel tubing connected to generator manufacturer-provided DEF dosing cabinets with buffer tanks. The bulk DEF tank and piping outside the building are all heat-traced and insulated. 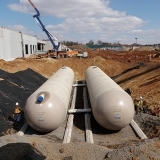 This project consists of (2) 10,000 gallon ConVault® thermally-protected UL-2085 tanks with integral secondary containment, priming pump, remote fill systems, electronic fuel level gauge and leak detection system, and underground double wall flexible HDPE supply and return piping serving (2) 1,400 KW generators and (2) 2,500 KW generators. 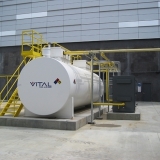 This project consists of (1) 20,000 gallon Fireguard® thermally-protected UL-2085 bulk storage tank with integral secondary containment and a single 8,000 gallon receiving tank with integral secondary containment serving (4) large Diesel Rotary Uninterruptible Power Supplies (DRUPS). 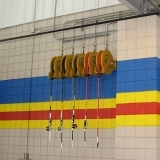 The containerized system includes PLC controls, redundant remote fill connections with offloading pumps and filtration, bad fuel pump-out connection, redundant duplex supply pump sets, independent duplex fuel oil filtration system, leak detection system, double wall steel aboveground piping with insulation / heat tracing, and double wall underground flexible piping. 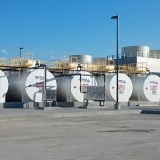 This project consisted of (4) 15,000 gallon Fireguard® thermally-protected UL-2085 tanks with integral secondary containment serving (4) large generators with including PLC controls, remote fills, bad fuel pump-out connections, duplex supply pumps, sub-base tank return pumps and controls, leak detection system, and double wall steel aboveground piping. 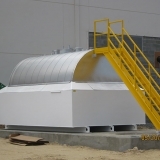 We also provided glycol tanks for this same project (See Water Storage Tank Gallery for Details and Pictures). This project consists of a remote fill and self-leveling system for (3) 15,000 gallon generator sub-base tanks. 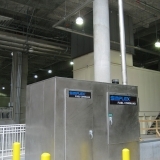 The remote fill system and controls are housed inside a stainless steel walk-in enclosure with double wall stainless steel remote fill piping to each sub-base tank with motorized tank selector valves. 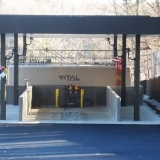 VITAL Fuel Systems worked with the owner’s engineer to design an automatic self-leveling system with PLC control, submersible pumps, and motorized tank selector valves that automatically transfer fuel oil between the three sub-base tanks to maintain an equal level in each. This project also included running remote emergency and normal vent lines. This project consisted of (2) 25,000 gallon double wall fiberglass underground storage tanks serving (2) new 3,000 KW generators including day tanks, PLC controls, leak detection system, submersible pumps, automated fuel oil filtration system, and underground and aboveground piping. 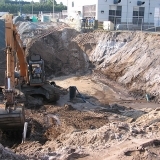 This existing operational data center site was challenging because we had to shore an excavation close to a building in an area with existing utilities and unstable soil including tying into the existing fuel oil system while keeping it operational to support the live data center. 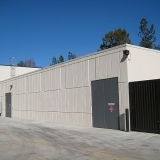 North Carolina Department of Corrections This project consisted of (3) 25,000 gallon, (1) 10,000 gallon, and (1) 5,000 gallon aboveground Fireguard® thermally-protected UL-2085 tanks with integral secondary containment serving (4) 2,000 KW generators, (3) large boilers and for vehicle fueling (On-Road Diesel and Gasoline). 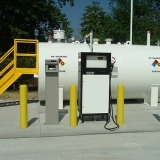 There are remote fill systems on each tank, a single multi-tank fuel oil polishing / filtration system, leak detection system, PLC controls, underground and aboveground piping, and a fuel management system to track transactions and prevent theft of vehicle fuel. 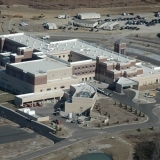 Carolinas Healthcare System This project consisted of (2) 35,000 gallon double wall fiberglass underground storage tanks serving (4) 2,500 KW generators and (3) large boilers including PLC controls, a fuel polishing / filtration system, leak detection system, and underground and aboveground piping. 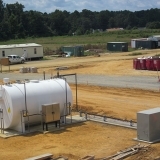 U.S. Army Forces Command / U.S. Army Reserve Command This project consisted of four 12,000 gallon and one 3,000 gallon Fireguard® aboveground thermally-protected UL-2085 tanks with integral secondary containment serving (3) 3,000KW / (1) 2,500 KW / (2) 800KW generators and (3) boilers at two sites including PLC controls, fuel polishing / filtration systems, leak detection systems, and piping. 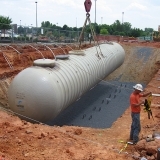 This project consisted of two 40,000 gallon double wall aboveground tanks with integral secondary containment located in underground concrete vaults serving (10) 3,000 KW generators including remote fills, fuel polishing / filtration systems, leak detection systems, submersible pumps, day tanks, and piping. 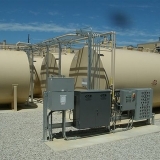 This project consisted of (1) 30,000 double wall fiberglass underground storage tank serving (1) generator and (5) boilers including controls, leak detection system, submersible pumps, fuel oil filtration system, and underground and aboveground piping. 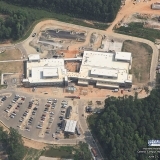 WakeMed Health and Hospitals This project consisted of (2) 25,000 gallon double wall fiberglass underground storage tanks serving (2) 2,500 KW generators with room for future generators including day tanks, controls, leak detection system, and underground and aboveground piping. ElectriCities of NC, Inc. (North Carolina Municipal Power Agency No.1) This project consisted of (1) 50,000 gallon aboveground double wall tank with integral secondary containment serving (2) 15,000 KW (15 MW) Solar Turbines gas turbine generators including remote fill, fuel polishing / filtration system, leak detection system, floating suction, piping, and oil-water separator. 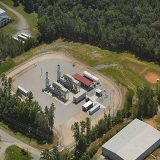 The dual-fired (natural gas and fuel oil) generators have jet engines which are very sensitive to water and debris so the filtration system and floating suction help ensure there is no damage from water or debris during operation. During the switchover from fuel oil to natural gas, the injectors must be flushed with distilled water. We also provided an oil-water separator which handles the oily water run-off from this process. At 100% load when operating only on fuel oil, each engine consumes 25 GPM. Combined, these turbine generators provide enough electricity to power 25% of the City of Monroe, NC. University Health Systems This project consisted of (2) 20,000 gallon double wall fiberglass underground storage tanks serving (4) 1,250 KW / (4) 1,750 KW generators including day tanks, controls, leak detection system, submersible pumps, and underground and aboveground piping. 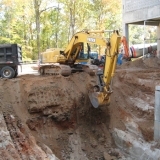 This existing site was challenging because the tanks were placed end-to-end sandwiched between the main underground power feed to the hospital and the phone lines. 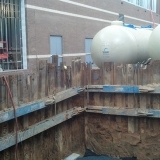 We provided and installed a shoring system to safely install the tanks and kept all existing critical utilities functioning with no negative impact to the hospital’s operations. This project consisted of a common remote fill system with automated tank selector valves serving (2) 1,825 KW generators with sub-base tanks including a leak detection system, double wall aboveground welded schedule 40 black steel piping, and capability to add (2) future generators. 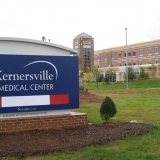 New Hanover Health Network This project consisted of (3) 20,000 gallon double wall fiberglass underground storage tanks serving multiple large generators at various locations across the hospital campus. The new fuel system was tied into and integrated with the existing fuel oil system and extended as required to serve the new generators. This was a particularly tough excavation in a coastal area which had to be de-watered prior to forming and pouring the concrete hold-down pad. 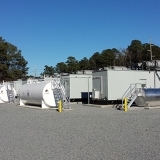 Hampton Roads Sanitation District This project consisted of (2) 20,000 gallon aboveground single wall fuel oil storage tanks inside a concrete dike serving (2) large generators with pump sets, leak detection system, remote fills, and underground and aboveground piping. This project consisted of (1) 5,000 gallon aboveground double wall dike tank with rain shield serving (4) boilers including a duplex supply pump set, leak detection system, automated fuel oil filtration system, and double wall aboveground black steel remote fill and supply / return piping. This project consisted of (1) 10,000 gallon aboveground double wall tank with integral secondary containment serving (1) generator including a 17 GPM duplex supply pump set, leak detection system, and 25 GPM automated fuel oil filtration system. It was constructed for ease of tying an additional tank and generators / boilers in during a future phase. 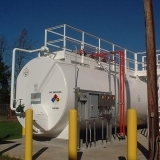 This project consisted of (1) 12,000 gallon thermally-protected UL-2085 aboveground tank with integral secondary containment serving (2) boilers and (1) generator including duplex submersible supply pumps, controls, and leak detection system. It was constructed for ease of tying in additional generators / boilers during a future phase. 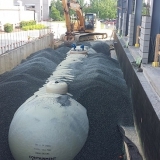 This project consisted of (2) 10,000 gallon aboveground double wall tanks with integral secondary containment serving (2) boilers and (2) generators including submersible supply pumps, controls, and leak detection system. 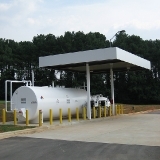 North Carolina Department of Health and Human Services This project consisted of (1) 10,000 gallon (Gasoline) and (1) 5,000 gallon (On-Road Diesel) aboveground Fireguard® thermally-protected UL-2085 tanks with integral secondary containment for a commercial vehicle fueling station including dispensers, fuel level gauges, remote fills, stage I vapor recovery, a canopy, and a fuel management system to track transactions and prevent theft of vehicle fuel. 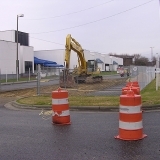 As the prime contractor, we were responsible for minor clearing, grading, concrete / asphalt, tank work, and all electrical. Sanderson Farms This project consisted of (1) 6,000 gallon (Gasoline) and (1) 10,000 gallon (On-Road Diesel) aboveground Fireguard® thermally-protected UL-2085 tanks with integral secondary containment inside a concrete dike for a commercial vehicle fueling station including dispensers, fuel level gauges, remote fills, stage I vapor recovery, and a fuel management system to track transactions and prevent theft of vehicle fuel. 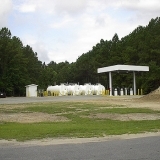 Brunswick County North Carolina Operations Services This project consisted of removing and disposing of (4) 10,000 aboveground tanks and providing and installing (4) new 12,000 gallon (Gasoline, On-Road, and Off-Road Diesel) aboveground tanks with integral secondary containment for a commercial vehicle fueling station including dispensers, fuel level gauges, remote fills, stage I vapor recovery, a canopy, and a fuel management system to track transactions and prevent theft of vehicle fuel. 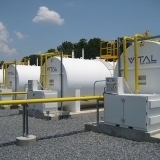 The VITΛL Safety Oil Sump is a very effective way to capture and contain spilled oil. 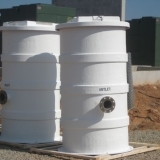 A Safety Oil Sump should be located between a bulk oil storage facility and the rainwater runoff discharge from a site. During normal operations, the rainwater runs through the sump and safely discharges. In the event of a spill, the oil fills up the sump to the point that the Oil Stop Valve sinks in the oil and seats, sealing the effluent, allowing the oil to be contained within the sump and backing up into the inlet drain. The specially-designed Oil Stop Valve is located inside the Safety Oil Sump and has a float ballasted to a specific gravity that floats in water and sinks in oil.